A few years ago I took on a three month contract that was just terrible. The details aren’t that important and I actually learnt a great deal about myself and my own boundaries in that position but what has dawned on me with time is that I doubt I would have had the same terrible experience if I’d been a man. Worse, is that, it was women who under pinned the drama and more women who fueled the fire in this experience. 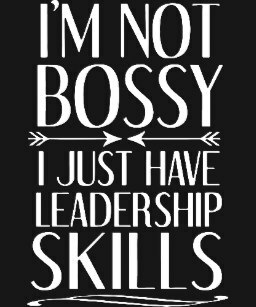 ‘I’m not bossy I just have leadership skills’ is really a simple quote that I often keep in mind. It’s not to say that some people are not bossy, there are lots and we are all probably bossy at times but more often than not women who lead in an environment that is not used to women leading are often mistaken for bossy.